A wee sanctuary in the city. 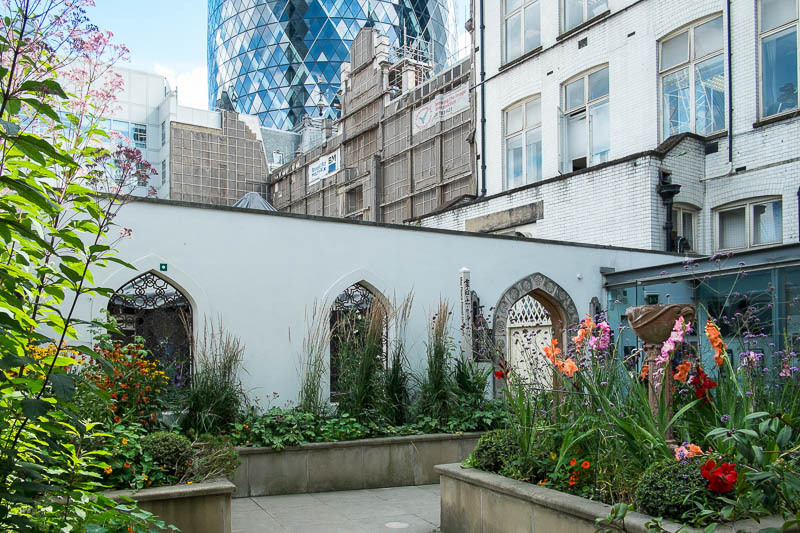 The garden of St Ethelburga's is tucked away surrounded by tall buildings on all sides. The original church dates back to the 15th century. It survived the Great Fire and the Blitz but was badly damaged by an IRA bomb in 1993. Rebuilt in 2002 it now operates as a centre for reconciliation and peace. A real little oasis, well spotted! What a beautiful little spot! That looks like a perfect little hide-away! As I can see the *gurken *, I shoud have been very near. without knowin it. A place of serenity in the midst of busy lives. Beautiful, that's a very special place, I love finding these oasis in the centre of London.. But even there you can't get away from modernity.